Holmes Property Firm is a real estate investment company that acquires, renovates and holds properties. We primarily do business in Washington, D.C., Maryland and Virginia, but we also do business in other parts of the United States. As a family run business, we strive to operate with honor and integrity. We are committed to making fair offers that benefit sellers. We know that when we renovate a homes, families are depending on us to provide them with quality places to live. Selling a home can be extremely stressful and painful. You don't need to worry about high renovation costs and pricey realtor fees. Holmes Property Firm will come in and make the entire process as painless as possible. Sell your home the easy and fast way. Contact us to get a cash offer today! 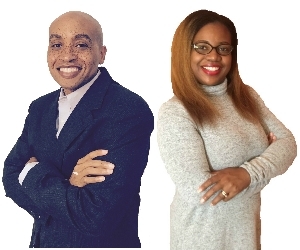 Clifton and Annie Holmes each hold bachelor’s degree from Temple University and master’s degrees from Penn State University. After many years of working in higher education and the non-profit sector, they have set their sights on real estate investing. After having less than positive experiences with the buying, selling and renovation of their own home, they decided to make sure that no one ever had to endure the experiences that they did. In 2016 Holmes Property Firm was founded. They want to ensure that people have great homes to live in and positive experiences.